B1G1 FREE Mimi's Cafe Breakfast or Dinner Entree w/p! 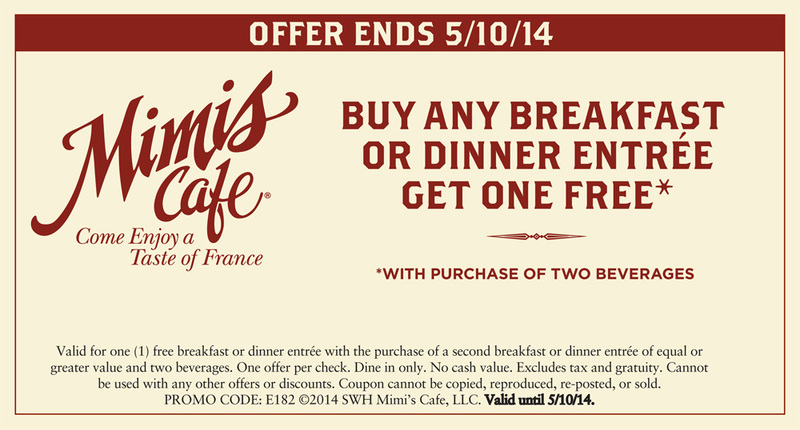 Here is a great coupon valid for either one (1) FREE Breakfast or Dinner Entree w/p of second Breakfast or dinner entree of equal or lesser value and 2 Beverages at Mimi’s Cafe! FYI:: This offer ends Saturday, May 10, 2014. Find your nearest Location! I am sooo excited! Olive Garden just released a totally rare $10 off $30 Coupon. All you have to do is either print this coupon out or show it on your mobile phone! Right now you can donate to a great cause and get some yummy food for your effort. Just head on over to Joe’s and donate to their Autism Speaks cause and receive coupons for FREE Food Coupons at Joe’s Crab Shack. And while you are there if you purchase a “Peace of the Puzzle” signature tie-dye T-shirt and 10 percent of proceeds will go to Autism Speaks. Locations. For every $1 donation, receive a free kids meal entrée; $5 donation for a free Crazy Good Crab Dip; and $10 donation for a free Classic Steampot. Don't forget that this Friday (January 31st) Panda Express is giving away FREE Firecracker Chicken! You'll need to either print this coupon or show it on your mobile device to claim your Free Firecracker Chicken. FYI:: This coupon is only available on Friday (January 31st) and is limited to one per person! **Hurry & Register** for a FREE Chick-Fil-A Breakfast Entree! Guess what?!? Participating Chick-fil-A restaurants are giving away one of a variety of FREE Breakfast Entrees! All you have to do is search for a restaurant near you and then register online. FYI:: This deal is subject to the Official Rules.